I have been a fan of The Lorax by Dr. Seuss ever since I was a little kid. I have devoured this children’s book front to back so many time that the illustrations have been ingrained in my head. Therefore I was very apprehensive about a feature adaptation based on this beloved book. The trailer didn’t manage to lessen my anxiety. This showed a lot of sub-par jokes and revealed that the movie would be much more than what’s presented in the book. It just didn’t look good. Now, having seen the complete movie, I must say that my fears were justified. This is not a good adaptation. Too much has been added. The book is a streamlined polemic against blind greed, the corruption of nature and the regret one can feel after doing something horrendous. Don’t get me wrong, it is all there. Not much from the book has been left out. It is the addition of a complete town where a greedy businessman is hellbent on keeping out anything that is natural to make sure that the air is polluted so he can keep selling his precious clean air that gets to me. It is all too much. The movie ended on a down but hopeful note and left you wondering. 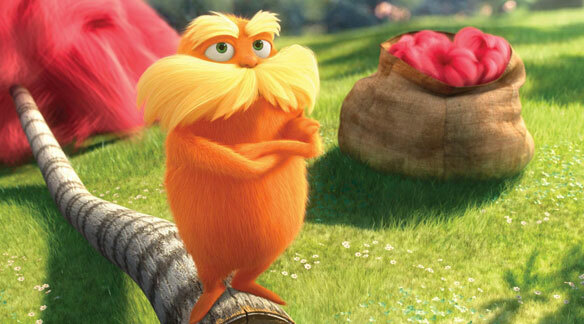 For lack of a better term, The Lorax has been Hollywoodified and thus loses a lot its power. The fact that they chose to present the Once-ler as a real person and not just a set of arms (as it was done in the book) sets us up to care more for him and makes us (more or less) forgive him for his acts. The addition of the Once-ler’s family was also terribly unnecessary. Usually you won’t find me ragging on a kids’ movie, because I full well know that these movies are not made for me. But this was based on a beloved childrens’ book and then you’d better get it right and this time they didn’t. If you have never read The Lorax, then maybe you can get something out of this mess, otherwise you will only be distracted by the fluff and the changes. On a brighter note, the movie looks gorgeous (even in 3D) and actually reflects some of the artwork by Dr. Seuss. Do you know what I found to be the best moment in The Lorax? The moment when during the credits the original Dr. Seuss art from the book rolled across the screen. Think about that for a second. Studio Ghibli is known for its imaginative animated feature films. Movies like Spirited Away and Ponyo display an astonishing array of outlandish visuals and ideas. Most of Ghibli’s feature films are the product of Hayao Miyazaki’s brain, which seems to know no bounds. For Ghibli’s newest feature, The Secret World of Arrietty, Miyazaki gave the reins to first time director Hiromasa Yonebayashi, who has been with the company since Princess Mononoke. And you feel the departure. Although Miyazaki is still very much in control of the production you do feel that another director is at the helm. The Secret World of Arrietty is an adaptation of Mary Norton’s famous children’s book The Borrowers, in which small people live under the floorboards of houses. They steal, or borrow, small amounts of stuff from the humans upstairs to provide in their needs. 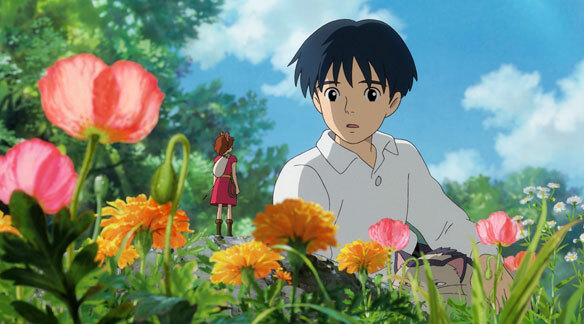 Arrietty, once of the borrowers longs to see the world outside and when a sick human boy accidentally sees Arrietty a struggle for survival begins. The Secret World of Arrietty is about little people and Yonebayashi realizes this very well. He knows that this idea in itself is outlandish enough, so he doesn’t feel the need to expand the absurdity of the story with strange creatures and such. The strangest things you’ll see are large insects and the biggest monsters is a fat cat living in the yard. The Secret World of Arrietty is a very grounded and quiet movie. It deals with feelings of abandonment, regret and fear in very human ways, while the main characters are only a few inches high. As is to be expected The Secret World of Arrietty is beautiful. The backgrounds are made up of astonishing paintings and the hand drawn animation is a breath of fresh air in these times when computer generated animation rules everything. The attention to detail is also wonderful. I loved the way the mom pours a cup of tea by putting a single drop in a cup. Beautiful. And there are numerous moments like this that will have you wondering who came up with such a rich world. I recommend The Secret World of Arrietty very highly. This is certainly one of the more forgiving Ghibli movies and a great starting point for a wonderful journey into the world of Hayao Miyazaki and Studio Ghibli.